Spanning Australia’s southwest edge from Cape Leeuwin to Cape Naturaliste, the Cape to Cape track is the longest coastal walk in Australia, 135kms from start to finish. The extraordinary landscape offers great variety, spanning squeaky white sand beaches, secluded coves, towering forests and limestone caves. The Cape to Cape track is a world class walk that traverses cliff-tops, deserted beaches, hamlets and villages, coastal heathlands, peppermint tree woodlands and majestic Karri forests with tall open stands of eucalypt, unique to the location. Starting in Perth at 8:00am, the first stop is the Margaret River Wine area for lunch. We then make our way to Cape Leeuwin where we do a full tour of the lighthouse. We get our first taste of the walk today with a short section on the Cape to Cape track to the historic waterwheel area. We then travel to our accommodation to settle in. Today’s walk is fairly lengthy but is well worth the effort, the highlights include Cape Hamelin, where there is a beautiful bay surrounded by granite boulders, sandy Deepdene Beach and a coastal section with unusual solution holes in the limestone rocks. There’s epic views over the Indian ocean as you walk almost the whole way. Explore a secluded stretch of coastline beginning with Boranup Beach. The variety of landscape traversed today makes the walking even more of a delight. Walk comfortably through coastal heathlands, eucalyptus and peppermint woodlands. There’s a section with masses of grass trees and the first of the tall karri forests. One of the most spectacular sections of coastline includes a remarkable grotto and natural spring at Bob’s Hollow. The ever present azure blue Indian Ocean has a calming quality that works in concert with the walking. The scope of the offshore reefs and the massive seas give you the first indication as to why this is one of the most heralded surfing destinations in the world. Walk straight from breakfast along the coast to cross Margaret River (tides permitting) through to Ellensbrook Historic Homestead. Ocean views are plentiful whilst you walk amongst a variety of flowering shrubs. To finish off the walk you pass Meekadarabee Falls and even a small grotto where a mysterious story unfolds. Continue past Ellensbrook Homestead, a National Trust property where the original owners built a water wheel that’s still operational. Highlights include Wilyabrup Cliffs which are popular with rock climbers, massive granite outcrops and two superb capes. We walk past Gracetown a small settlement overlooking Cowaramup Bay. There’s an opportunity for a coffee break and then onto Moses Rock where we finish walking today. There’s a long distance to cover today, but it is scenic the entire way. Massive granite outcrops and two superb capes at Cape Clairault and Canal Rocks. The beaches here are also popular with surfers. Today’s walk ends in the small town of Yallingup. The final section of walk passes Sugarloaf Rock, a summer home to red-tailed tropic birds. Much of the coast here is limestone, with short stretches of beach and low rocky areas and the ever present massive seas. The 135 kms Cape to Cape walk culminates around lunchtime at the lighthouse at Cape Naturaliste thus completing the longest coastal walk in Australia. We then drive back to Perth arriving at approximately 5.45pm. The Cape to Cape Track is generally well graded and relatively easy to negotiate. Full day walks average about 20km. There are opportunities for fit walkers to challenge themselves on rather lengthy walks of up to 23km. 7 night’s accommodation in a comfortable room in a lovely beach house at Margaret’s Beach Resort. The living space and bathrooms are shared. If you would like a single supplement room there is an additional cost of $255. As one of the bathrooms is adjacent to a bedroom, we ask that the occupants do share the bathroom with other guests when and as required. There are limited private ensuite rooms available at a small extra cost of $300 per walker (based on double/twin share accommodation). These are located right next door to the beach house. Contact our office for further details. Enjoy a 2 course meal each night, either in-house prepared in conjunction with our guides and a renowned local caterer or out at local Margaret River restaurants. We also dine at a few select restaurants in the region. We start each day with a hearty breakfast provided communally in the beach house dining room. Walkers lunches are substantial with great variety ensuring that you’ll never go hungry. More importantly, we eat lunch at stunning natural locations on the Cape to Cape track that can only be reached by foot. Walkers will enjoy staying in one centrally located accommodation each night, right next to the track and the beach. The living spaces and bathrooms in the beach house are shared. There are single supplement rooms available at an additional cost. There are also limited private ensuite rooms available at a small extra cost of $350 per walker (based on double/twin share accommodation). These are located in close walking proximity to the beach house. Dining will still be communal at the beach house. Contact our office for further details. Alcohol and drinks are not included with meals (except for limited wine, tea/coffee and juice with breakfast). The walking is moderate to challenging but done at a pace that suits everyone. Walks consist of mostly coastal tracks with some bushland 4WD tracks and sections of beach. On average, we walk 17 km per day, with longer days reaching distances of up to 24 km. 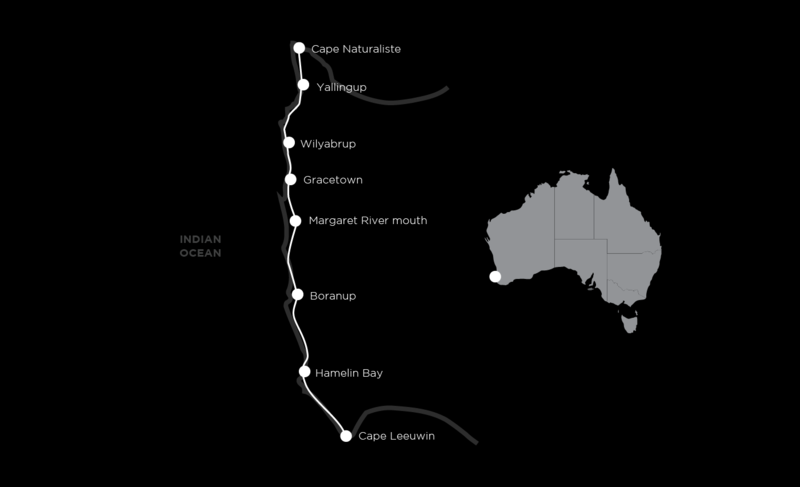 This is a rewarding expeditionary hike and at 135kms, making it Australia’s longest coastal walk. Two professional and experienced guides, knowledgeable of the area and its natural surroundings can offer easier and more challenging walk options along the way. Pre and post tour accommodation: There are many good hotels in Perth, however we pick up and drop off from one central hotel the Miss Maud Swedish Hotel, 97 Murray Street, Perth. The tour starts at 8:00am at Miss Mauds. We arrive back in Perth at approximately 5.45pm on the last day. This trip can easily be combined with the Bibbulmun Track group-guided trip for an extended Western Australia walking holiday. See the Bureau of Meteorology’s information about temperatures and rainfall ahead of time to ensure proper clothing.